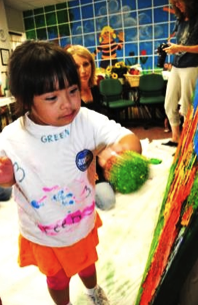 Down syndrome and other developmental delays affect children regardless of background or economics, so Rise’s student body represents every race and socio-economic level. We do not want to limit any family’s access to our school based on their ability to pay, but do want to ensure every family is committed to their child’s education by charging a monthly tuition. For families with financial need, Rise offers tuition assistance scholarships of 20%-70% off tuition. 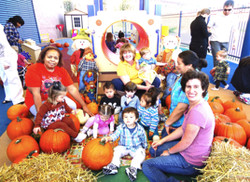 Our current monthly tuition is one of the lowest rates in Houston among schools for children with special needs and high-quality preschools. About 60 students qualify and receive scholarships off our full rate, ranging from a reduction of 20% off to a maximum of 70% off. The average award is $600/month or $7,200/year. Scholarships are a great investment in the child and our community. We believe that the more resources we invest in a child with development disabilities at a very early age, the far fewer he or she will require as an adult. Give to this program now. In each Rise classroom, you will find a remarkably low 3:1 student to teacher ratio. Each class is led by a Masters-degree-holding teacher and two teaching assistants all dedicated to helping children with developmental disabilities and their traditional learning peers to blossom. Our teachers love working here, as evidenced by our very low teacher turnover since founding 12 years ago. Today, Rise employs 11 master teachers, 24 teaching assistants, plus 5 therapists, 10 classroom assistants and 5 person admin team. But quality doesn’t come cheap! About $900,000 goes to salaries and benefits, the majority of Rise’s annual budget. Give to this program now. The familiar adage goes “talk is cheap – actions speak louder than words.” At Rise, when we say that children with disabilities can finish school, join the workforce, and contribute to society as taxpayers, we put our talk into practice. In every Rise classroom, you will find an adult with developmental disabilities employed full-time as a Classroom Assistant. Today, ten wonderful men and women, each beloved by the students and appreciated by the lead teachers, help our classrooms function more effectively and joyfully. It’s a unique program of which we are enormously proud. We are looking for a special supporter to underwrite some or all of its cost. Give to this program now. Walking through Rise, everything looks like a typical preschool, but stealthily at work, under the guise of “fun and play” are a team of highly-trained professional therapists – music, occupational, physical and speech therapists and a language assessment specialist, who work individually and in classrooms with each child to achieve developmental benchmarks that prepare students for success in K-12 and life. Our therapists’ enthusiasm and focus are contagious. Once you see them in action, you will be clapping, singing and skipping along with them and our students. 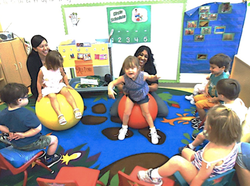 In the classroom, music therapists lead songs, use instruments, and dance to build speech and motor skills while physical therapists focus on gross and fine motor skills like running, jumping, climbing, and coordination on large playground equipment. 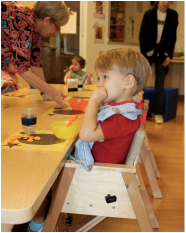 Speech therapists and language assessment specialists help develop spoken language and communication skills while occupational therapists help children master life skills like feeding themselves, writing, walking, and using keyboards. Who knew brushing your teeth by yourself at age one could build muscles, be fun, and establish a life-long healthy habit? Our occupational therapist did! Give to this program now. Each year, over 250 students in fields of medicine, optometry, nursing, physical therapy, music therapy, speech therapy and special education visit Rise to see first-hand the issues of children with special needs with visits every week. The Baylor and UT Colleges of Medicine, UH College of Optometry, nursing and allied health schools send students to Rise for half-day observations to multi-week internships. Rise provides this opportunity for students at no cost. Our administrative staff coordinates the program, meets with each visiting student, offers guided facility tours and question and answer sessions. It takes a lot of our staff’s time to meet and work with these students and young professionals, but it is part of Rise’s mission to improve and expand the care and education of individuals with developmental disabilities. Give to this program now. Rise staff use curriculum instructional materials like books, blocks and math manipulatives in classes every day. These items build intellectual capabilities, while building fine motor skills. Some are designed for one-time use like workbooks, while stacking blocks and board books are used repeatedly until they wear out. Boy, do they wear out! We have to replace these items frequently. Please help us keep these essential supplies in stock with a gift! Give to this program now. Children with Down syndrome and other developmental disabilities suffer from hypotonia, which means “low tone” or weak muscles which seriously affects many acts from walking to speech. 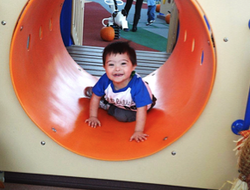 Through Gross Motor Therapy sessions in class and on our playgrounds, our students work their core muscle groups on soft mats, rolling barrels, slides, trikes and more. As they merrily play on cool, big toys under the direction of physical therapists and teachers, they build up large muscle groups in their legs, spine, core, arms and lungs to combat their low tone. The result of this barrel of fun is improved walking, running, breathing, and speech. It also helps their bodies avoid the compensating activities and gait common to individuals with developmental disabilities. Give to this program now. Finger painting sure is fun, and it serves a larger purpose. Students develop fine motor skills through activities like tearing, cutting and gluing papers, finger painting, and using brushes and crayons. They develop muscle control, strength and dexterity, in addition to feeding their creative sides. It takes stacks of art supplies every day just to keep up with them! Give to this program now. Curiosity about the world is as natural to a child as laughter. Helping children learn how to make scientific observations, test hypothesis and make conclusions prepares them for the academic rigor of school and employment. Each year, Rise conducts week-long science labs several times a year for all its students. 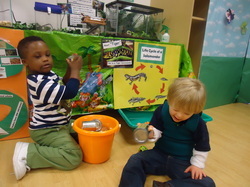 From ages infant to pre-K, our children explore, experiment and learn about the natural world, simple machines, scientific principals and more. Lab topics might range from learning about the states of matter (that’s gases, liquids and solids as a reminder); chemical reactions; the weather; life cycles of insects; and plants. Give to this program now. Preparing meals for ourselves is a life skill we start as toddlers. At Rise, what others call snack time, we call “skills of independence.” Help us purchase those tiny milk and juice cartons for daily snack time which little hands must, by themselves, pick up, carry, open, insert a straw, drink, then clean up when done. It’s not as easy as it sounds, just ask any parent of an able-bodied tween or teen especially at clean up time! Give to this program now. School isn’t all classroom activity. Field trips and activities celebrate special times of year. 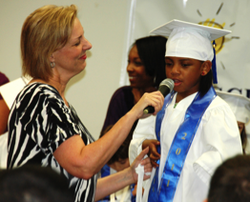 A favorite is each July when our six-year-old Pre-Kindergartens graduate from Rise ready to enter mainstream kindergarten. Their graduation ceremony, complete with cap and gowns, leaves nary a dry eye in sight among proud parents, staff and visitors. Give to this program now. To ensure the successful transition of Rise’s five and six year olds into their next learning environment, our Executive Director personally attends transitional “Admission Review and Dismissal meetings” at each student’s new kindergarten. This is an extraordinary step taken by few other schools, but so important as many public and mainstream schools have encountered so few children with developmental disabilities that they may automatically place children into Life Skills, or special education classrooms. This can be a shame since Rise students are so prepared academically and socially, that they are ready for the reading, writing and math requirements for kindergarten and first grade, often testing above the other entering typically developing students. Rise believes that students develop best when they can see and model after their traditional learning peers, and thus recommends that our graduates spend as minimal time during K-12 in a Life Skills classroom as possible. Their presence in a mainstream classroom helps all children develop understanding for people with differences – qualities that benefit them throughout life. Give to this program now. One of our outdoor spaces in our new facility is the perfect location for a Sensory Garden. A professor and students at the Art Institute of Houston presented Rise with exciting preliminary designs that would incorporate large moveable pots plus a water feature. 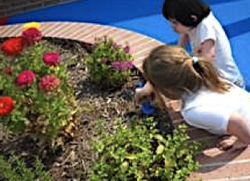 Filled with plants of different scents, textures and colors, some edible, the sensory garden allows students not only to become little gardeners, but budding biologists as they water, maintain and observe their plantings and study the beneficial insects they attract. Give to this program now. We hope you’ve discovered more about The Rise School and understand our mission after reading this. We hope you’ve learned that Rise offers intensive education, intervention and therapy to young children with developmental disabilities in a program that is fully integrated with their traditional-learning peers. Perhaps even one program captured your heart and mind above the others, and you’ll decide to support it. But trying to choose one favorite Rise program to support can be like trying to select one delicious ice cream to eat from among 31 intriguing choices. If this is the case for you, we have a suggestion – general operating support! An unrestricted gift for general operating support is the simplest way to support Rise. We will put your contribution towards our operating budget where it will support a little bit of everything: scholarships, therapy, staff salaries, supported employment, supplies and more. Give to this program now.